Below you will find a list of all the Bet Motion Casino bonuses - offered to new players. The right side offers a casino overview (click to scroll through the images). 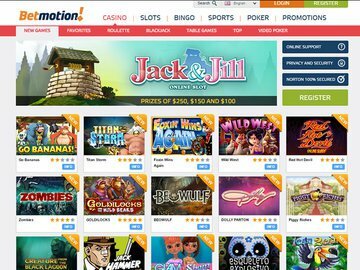 BetMotion casino is part of the BetMotion gambling brand comprising a virtual bingo hall, sportsbook and poker room. They are owned by Vision Media Services, an international entertainment group with more than 17 years' experience in the industry. Together with a selection of propriety games developed in-house, you'll have instant access to a 100-strong content library featuring best performing free spins slots, table games and video poker variations by Leander Games, Net Entertainment, Betsoft, Microgaming and NextGen Gaming, amongst others. Despite the availability of a wide variety of mobile slots from the likes of the Net Ent Touch and Betsoft ToGo series, a BetMotion mobile casino is yet to be launched. The casino is tailored for the Latin American market. There's support for the Brazilian Real and Spanish and Portuguese, together with English, are the only available game languages. Thankfully, players from Canada are among a small group of nationalities given the thumbs up to bet and play at the venue. Compatible banking methods, multilingual support services and the option to wager in EUR or USD provide easy access for Canucks intent on cashing in on no deposit BetMotion casino bonus codes and a plethora of games. Betting beginner's at the casino benefit from a welcome bonus code valued at up to $700 free. The first two deposits trigger 100% cash matches up to $350 apiece. To claim the bank roll boosters, simply enter the corresponding coupon code during the registration process, deposit at least $20 and the free loot will be credited to your account within no time at all. In addition, you'll discover an array of lucrative promo codes updated on a regular basis. There's cashback on losses on selected free spins slots, daily survivor slots tournaments, no deposit raffle prize draws and reload offers. Elect to fund your account with Neteller or Entropay and you'll benefit from an alternate method bonus. Recommend the site to a friend and you'll earn 50% of their opening deposit to wager away at will! Step into the casino and you'll discover a comprehensive selection of games hand picked from the game suites of some of the best known game developers - Net Entertainment, Betsoft, Microgaming, NextGen Gaming and Leander Games. 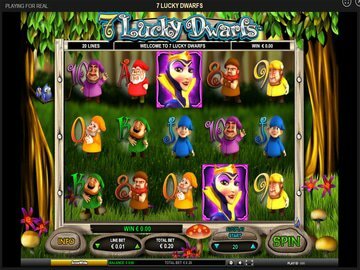 Classic and multiline video slots, some of which feature 3D graphics, exhilarating animations and brilliant game themes, are complemented by high performance table games and single and multihand video poker variations. You'll have instant access to hot new titles such as Foxin' Wins Again, Red Hot Devil, South Park: Reel Chaos and Dolly video slots directly from your browser. Players can select the appropriate gaming language onscreen, with English, Portuguese and Spanish the only options. The vast majority of software developers featured on the site have tweaked best selling slots for the portable platform. The only missing piece of the puzzle is the development of a BetMotion mobile casino. To remain competitive it's essential to offer games optimised for Android and iOS devices. We look forward to the day when the casino supports mobile slots such as Age of Discovery, Blood Suckers and 1 Can 2 Can for anytime gambling anywhere. Banking is supported in EUR, USD and BRL, transactions are encrypted using industry standard SSL encryption technology and the platform is VeriSign certified as secure. A variety of banking methods are available and include Visa, Visa Electron, Mastercard, uKash, ClickandBuy, Click2Pay, UseMyFunds, Paysafecard, Entropay, Astropay, Neteller, Skrill and bank wire. The venue is licensed in Curacao and the game engine is eCogra certified fair. A trained and attentive multilingual customer support team is available to troubleshoot on your behalf. Players are urged to contact the casino should they experience difficulties registering an account, making a deposit or withdrawal or claiming a BetMotion casino bonus code. Contact points are a telephone number in the UK, an online contact form, live chat and email. BetMotion casino is a reputable gambling destination owned by an established international entertainment brand. Games are cherry picked from the game libraries of well known software brands, bonuses are attractive, though average, and the site features all the necessary third party accreditation. A couple of no deposit bonus codes and a mobile casino compatible with iPad, iPhone and Android devices and featuring free spins mobile slots from the Touch, Go and ToGo collections would improve the overall casino experience. Leander Games Online Gambling Partnership Launches 130 New Games.